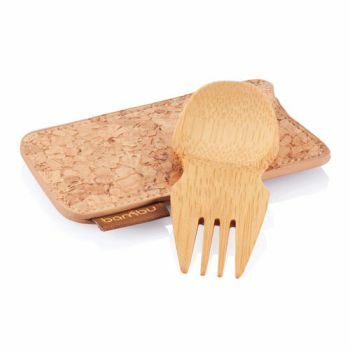 One of bambu's specially designed travel pieces for people on the go, the 'spork & cork' contains one of our best-selling sporks in a stylish cork fabric sleeve. As the clever name suggests a spork is a cross between a fork and a spoon and is ideal for keeping in a lunch box and for picnicking. Made from a single piece of bamboo, then hand shaped and finished. The handy carry case is ideal for keeping the spork in your bag. It is made from cork fabric - an innovative material made from a thin layer of cork applied to a cotton backing. The cork fabric is amazingly supple and tactile, with a lovely matt finish and a smooth leather-like feel. It is also very durable, anti-microbial, water and stain resistant and is even machine washable. The spork can be washed in the dishwasher however, as with wooden products, we recommend hand washing to prolong life. The case can be machine washed on a cold cycle.